Now that there are grandchildren in my life, I’m spending more time shooting, editing and publishing video. With family members in six states asking for more videos, I’ve created a website for posting and sharing clips and my blockbusters. YouTube, of course, will store the videos and provide code for embedding a player on a web page. But I’ve also found an interesting alternative that doesn’t require me to surrender my content. Easy HTML5 Video is a free processing utility that will convert video from any common format into HTML5. What’s HTML5? It’s a recently-developed markup language (the fifth version of the HTML standard) that plays video on a variety of platforms (desktop, mobile, tablet etc.) and works with all of the most widely-used browsers. Have you ever tried to play a video and been told you need a codec or a different player or a newer version of Flash? HTML5 avoids all that nonsense. 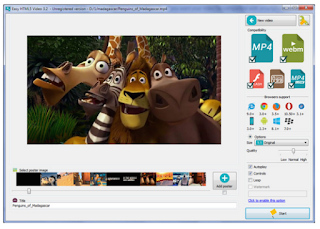 With HTML5, you don’t have to upload your clips and movies to some third-party resource like YouTube. The video stays on your server where it can be easily updated and where you control who gets to see it. And, as its name proclaims, Easy HTML5 Video could hardly be easier to use. I downloaded and installed the Mac version from the Easy HTML5 Video website, which asked for my email address but did not require registration or any personal information. Once launched, the software presents a drag-and-drop window where I deposited an MP4 video that I had created in iMovie using video from a Periscope session on my iPhone. The program starts by asking you to select a poster image. You can select a frame from the video or upload a separate image. Next, you select compatibility options for the output file. Do you want Ogg, WebM and low-res MP4? Just click those icons. Don’t care about Flash? Leave it unchecked. You can also change resolution quality in steps from 240p up to 4K. Converting my 2-minute video took less than 10 minutes and I couldn’t see any loss of quality in the converted version. Once the process is finished, the program offers to export your new video to a local folder or to an FTP directory. It also provides a code block for inserting the video, with player controls, directly into an HTML page. The Easy HTML5 Video website has more details and free versions of the software for Windows or Mac. With the free version, there are no limits to the number of conversions you can make for non-profit use, but it does apply a watermark to the converted video. There’s a commercial version for $69 and an enterprise version is $99.